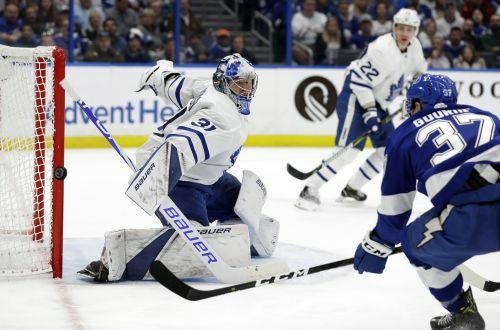 TAMPA, Fla. (AP) — Mitch Marner scored a go-ahead goal late in the second period, Nazem Kadri and Patrick Marleau each had a goal and an assist, and the Toronto Maple Leafs beat the NHL-leading Tampa Bay Lightning 4-2 on Thursday night. Frederik Andersen stopped 36 shots, and Zach Hyman added an empty-netter for the Maple Leafs. Brayden Point and Victor Hedman scored for Tampa Bay, and Andrei Vasilevskiy made 27 saves. Nikita Kucherov, the NHL points leader with 76, had an assist after two straight games without a point. BOSTON (AP) — Chris Wagner scored the go-ahead goal 5:27 into the third period, Tuukka Rask tied a Boston record with his 252nd career victory and the Bruins beat St. Louis. Rask made 28 saves and matched the franchise mark set by Cecil "Tiny" Thompson, who was 252-153 with 63 ties. Rask, the 2014 Vezina Trophy winner, is 252-145-56 in 474 games with Boston. Torey Krug, David Backes, Brad Marchand and Sean Kuraly also scored for the Bruins. Ryan O'Reilly and Carl Gunnarsson scored for St. Louis. Blues left wing David Perron extended his NHL-leading and career-best points streak to 13 games with an assist on O'Reilly's goal. ST. PAUL, Minn. (AP) — John Gibson made 37 saves for his second shutout of the season, Adam Henrique and Rickard Rakell scored 11 seconds apart in the first period and Anaheim beat Minnesota to end its franchise-record 12-game losing streak. Brian Gibbons added his second goal of the season for Anaheim, which made four trades in the previous three days. Alex Stalock allowed three goals on eight shots for the Wild before being pulled in favor of Devan Dubnyk, who stopped 15 shots after he was expected to get another night of rest. NASHVILLE, Tenn. (AP) — Connor Hellebuyck made 37 saves and Winnipeg beat Nashville to stay alone atop the Central Division, four points ahead of the Predators. Brendan Lemieux scored twice, and Mason Appleton, Bryan Little and Brandon Tanev added goals to help the Jets win their fourth straight. Viktor Arvidsson scored for Nashville. DALLAS (AP) — Dustin Brown scored a rare Los Angeles power-play goal, goalie Jack Campbell beat the team that drafted him and the Kings moved out of the NHL basement. Brown's goal came in the first period when he deflected in a shot by Drew Doughty. Carl Hagelin added a goal in the second. Campbell made 29 saves, allowing only Esa Lindell's goal with 1:04 left and Dallas goalie Ben Bishop off for an extra skater. NEW YORK (AP) — Chris Kreider had a goal and an assist, Henrik Lundqvist moved into a tie for sixth place on the NHL victory list and New York beat Chicago. Brandon Saad, Alex DeBrincat and Dominik Kahun scored for Chicago. The Blackhawks have lost five straight and seven of eight. UNIONDALE, N.Y. (AP) — Anders Lee scored twice and New York beat New Jersey for its ninth victory in 11 games. Michael Dal Colle had his first NHL goal and Jordan Eberle also scored, Nick Leddy had two assists and Robin Lehner made 16 saves to improve to 10-1-0 in his last 11 appearances. Andy Greene scored for New Jersey.